No matter if you need a dozen of business cards for yourself or thousands of them for your clients, Business Card Maker provides you with a cost-effective solution. This handy software has everything you need to make any number of stylish business cards or badges in mere minutes. No special knowledge or design experience is required - simply download Business Card Maker and create stylish multi-layered designs with logo, photo, lines, shapes, and rich text with simple drag & drop. This excellent business card software comes with hundreds of themed templates for different areas. Beauticians and hair stylists, photographers and designers, shop keepers and caterers, doctors and educators, lawyers and realtors, auto mechanics and IT engineers will all find a bunch of stylish templates to choose from. Download Business Card Maker and be sure to find YOUR perfect card template among more than 550 designs. For those who prefer to create their own card design from scratch, there are over 800 backgrounds and cliparts to choose from. You can also use the graphics library to customize a ready-made template so it becomes truly unique. The program has an integrated database where you can store your contact details and company data. Every time you need a new bunch of cards, simply pick the design template, then open the database and fill out the text fields with a single click. This option is especially convenient for large companies and designs studios that need to make cards for lots of employees or clients. They will also appreciate the import feature: upload hundreds of database entries from Excel or CSV files. For small businesses and entrepreneurs, business card software is a smart alternative to expensive designer services. With an app like this in hand, you don't have to worry about the minimum order quantity which is a common problem when you order cards from professionals. 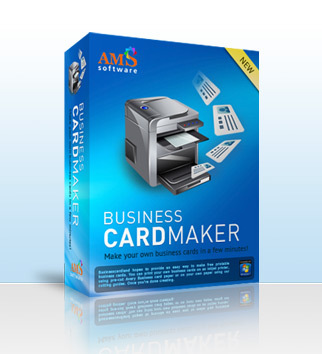 Download Business Card Maker and print any number of cards - even just one if you don't need more. The software produces professional quality prints in 300 to 600 dpi resolution. It allows you to print on any paper or cardstock and create perfect print layouts with bleed and crop marks. If you prefer to send the cards to a printshop rather than print them in house, you can choose to save the layout as PDF, JPG, PNG or TIFF (CMYK) in premium quality, up to 1200 dpi.